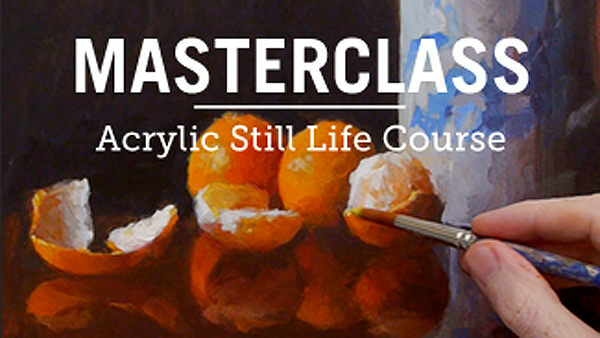 Still Life Acrylic Masterclass Course is Live! Morning class! The Still Life Masterclass in Acrylics course is now available, whoo hoo! At some point in every artist’s development you get to a stage where your paintings are looking pretty good, you can see your improvement from where you first began but some tricky subjects still elude you. You’ve got a basic understanding of colour mixing, paint application and your drawing’s sound but you want to take your work to the next level. I’ve created this Classical Still Life Masterclass with acrylics, to help aspiring artists to bring their paintings to a more professional finish. 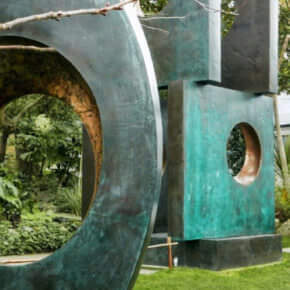 We deal with the more complex subject of reflective surfaces such as Silver, Ceramic & Mahogany using an extended palette and multi-layered glazing techniques. My Still Life Masterclass Course and is now available and you can learn more and join the course by just clicking this link. Just bought your course and wanted to tell you that it is just great. The videos are very clear, as are the instructions. I can hardly wait to start painting. Nice to hear from you, and thanks for buying the course! Really pleased you’re finding it clear and easy to follow. Looking forward to hearing how your paintings turn out. Wow this is NOTHING like I thought acrylic painting could be! I have only ever worked in watercolors but wanted to paint in a more painterly fashion (and I admit I have always been jealous of how oil and acrylic painters don’t have to be so concerned about preserving the whites/lights!). This course has me chomping at the bit to paint in this medium but I must (impatiently) await the arrival of the acrylics kit I’ve ordered. 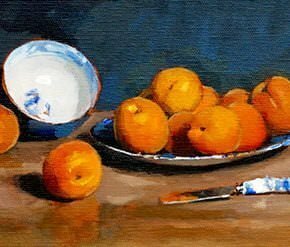 I have a question about the glazing, particularly as you do it on the oranges painting. Are you waiting for the existing paint film to be dry to the touch before glazing or do you glaze wet into wet? Or does it “just depend” on what you’re trying to accomplish in a given moment? I wasn’t quite sure on this point as I watched. Also, it looks as if the pressure you use when rubbing glazes off with a paper towel varies by how subtle you want it to appear, correct? Sometimes you were quite aggressive, removing almost all the glaze; other times, I noticed you used a very light touch. Just wanted to confirm that was what I was seeing. Thanks so much for a great instructional video…very professionally done, clear, progressive, and logical. I am so happy I discovered your site. Combining what I already know from my watercolor work with your generous instruction, I feel quite confident that my acrylic work will be satisfying from the get-go. Now hurry up, post office, and deliver my stuff! Are you waiting for the existing paint film to be dry to the touch before glazing or do you glaze wet into wet? Or does it “just depend” on what you’re trying to accomplish in a given moment? Exactly right, it depends. Usually if you’re trying to achieve a softer, smoky look, you’ll work wet-into-wet with the glazes. Whereas if you’re just toning down a whole area you can paint wet over dry. With oils you would always paint wet over dry, but with acrylics you have to slightly adapt due to the quick drying nature of the medium. Also, it looks as if the pressure you use when rubbing glazes off with a paper towel varies by how subtle you want it to appear, correct? Sometimes you were quite aggressive, removing almost all the glaze; other times, I noticed you used a very light touch. Just wanted to confirm that was what I was seeing. 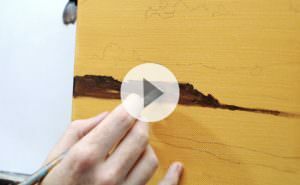 Yes, that’s correct, you can apply the glaze, judge the colour when it is on the canvas and determine how much or little to remove with the paper towel, or to leave the glaze without taking any away with the paper towel. 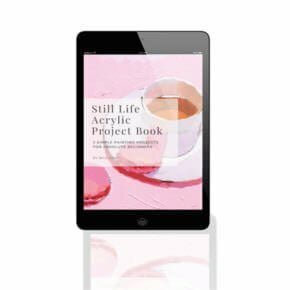 Hope this helps Carole, and your acrylics arrive so you can get creating! Hi Will…I thought I’d share a painting I made based on the techniques I learned in this and your other videos. Obviously my style is a bit tight (I seek to loosen up but I blame my portrait work in watercolor for this temporary shortcoming!). I have to say I was both surprised and pleased with how much fun it was to paint with acrylics! Thanks for lighting the path for me! Great work on your painting, it’s so brilliant to hear you’ve been pleased with your results working with acrylics on the course. 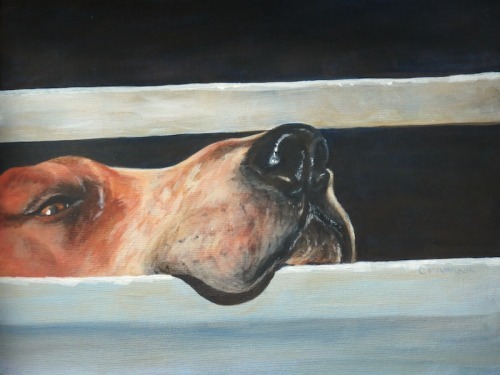 The face has great tone, colours and detailing to it and you’ve transferred your watercolour skills really well. Just wanted to say how much I’m enjoying this course. As ever the instructions are clear and the course is very informative – it has answered many questions for me and showed me how to acheive effects that I didn’t think were possible with acrylics. Can’t wait to finish off my glazes! 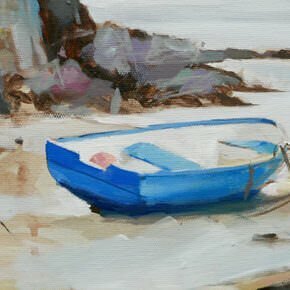 Great to hear from you Eamonn, and really pleased you’re learning new techniques with acrylics and finding the course clear and easy to follow. Looking forward to seeing your final painting! I finally got around to watching my videos …. I LOVE this class!!! Every time I watch it I get something new out of it. Well I have only watched it twice but I am sure I will keep going back to it over and over. I have been wanting more help and information on getting oil painting effects with acrylics. Finally, this class was exactly that. And the pace is perfect and I appreciate that you explain why you do what you are doing. Thanks so much! Hi Cynthia, thanks so much for the link to your painting and really pleased you’ve been finding the course helpful to your painting. Love the originality of your composition and the balance between warm and cool colours. The donut has been painted especially well, it has got a great sensitivity to the brush marks. A couple of subtle tweaks, and I’m being super picky! When painting fingers, try to imagine them as cylinders so the form moves from light to dark and has a volume to it, if you notice on the little finger the tones are very light/dark which can create a flatness to the painting. 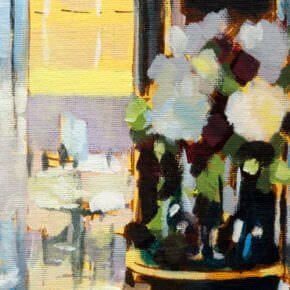 Watch out for tangent line in your composition, as the line of the little finger continues to the pattern on the tablecloth and sends the viewers eye out of the piece, rather than focusing on the main focus. Thanks for the helpful tips and complements! Especially about the Tangent line – I honestly wouldn’t have even noticed that but I will be keeping that in mind from now on. You’re welcome Cynthia, pleased it helped. So glad you survived your Provence adventure! I just completed your Still Life Masterclass in Acrylics. I would strongly encourage any aspiring, beginning, or even burgeoning artist to take the course. 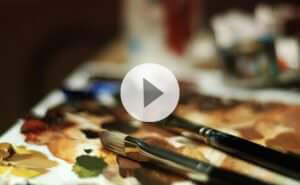 The painting demonstrations — which are beautifully videotaped — provide a wealth of information about so much of what makes paintings excellent and really “sing”: dark/light value changes to move the viewer’s eyes around a painting; color changes and color mixing; laying in shadows and highlights with great color mixing; brushwork; glazing techniques; and so forth. I love your instructional videos, both to learn sound drawing and painting techniques that will deepen my foundational knowledge and skills and move my painting to new levels, but also to understand whether I am doing something right! I found myself throughout your course videos, alternately thinking “So that’s how you do that!” and “Wow, I’m actually doing that right!” I have watched the oranges/mahogany table video several times now, paying careful attention to how you build a painting from the under painting to very subtle details and glazing — and to that wonderful “singing” level. Thanks, Will! Thanks so much for you kind critique of the acrylic masterclass. Really great to hear you have been learning new techniques, and reinforcing existing ones to bring your paintings to that next level. Your work is amazing! How do you keep your acrylic paint so workable? Do you add any acrylic paint retarder when you start to the paints? Hi Ana, I don’t usually add retarder to the paint, but the glazing liquid will help to keep the paint more workable. 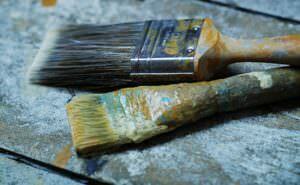 Also, the volume of the paint that is laid out onto the palette will keep the paint wetter for longer.